Does your petrol station have all the required security measures it needs to protect staff and customers from unexpected criminal incidences? Most petrol stations are commonly manned by a single staff member or in pairs, depending on the size of your petrol station. With slim margins and constant competition in the industry, most petrol stations also act as convenience stores. Not only does the petrol pump stations need constant monitoring to prevent driveaways, you will also need constant monitoring of the cashier and retail area to prevent daylight robberies or petty thefts of your stock. While juggling between running your business and optimising profits, finding affordable security solutions may appear difficult as you’d want the best security available for your business. That is why our experienced team at Serious Security have developed a common package that is well suited to most petrol station businesses. 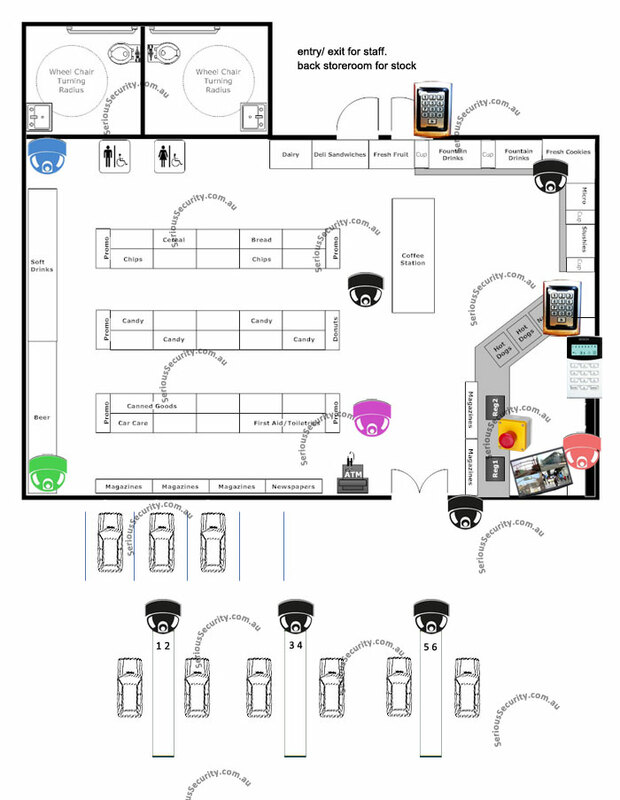 Below is a sample petrol station floor plan of how most owners choose to set up their security equipment. High definition IP Network cameras are recommended to all our petrol station clients. This will ensure you receive high resolution images and recordings of your business premise with the ability to see fine details such as number plates on car. Just like a convenience store, there will be aisles and shelving rows that may obstruct the view of customers from the cashier counter. While all customers usually appear trustworthy, it is not unusual to lose hundreds of dollars worth in stock a year due to petty thieves. Depending on how large or small your store is, as well as what other facilities you provide outside your store such as gas, toilets or other retail items that may sit outside the store, our technician will help advise where your cameras should be fitted to provide maximum monitoring view of vulnerable areas. High traffic areas should be noted by your team for our technician to position cameras that capture recordings of all customers and visitors to your store. Many of the cameras will be fitted within the pump stations and within the store’s ceiling to provide maximum view on all customer activities to give you peace of mind that your premise has optimal view of all potential hazards or criminal activities. All our CCTV packages come with a quality 19 inch monitor to allow back office staff to monitor common areas whether there is frequent supervision or not. All our packages also include remote viewing connection to your smartphone or tablet so you can monitor your business from anywhere, anytime. A reliable alarm system will ensure that your business premise is well protected outside business hours. Ask about our mobile phone alert connection which will give the added comfort that you will be alerted should your business alarm has been set off. Our 24/7 alarm monitoring service or back to base monitoring is a direct connection to the Security Alarm Monitoring Centre (provided by our vetted monitoring partner). You benefit from an immediate response 24/7 whenever your alarm has been tampered with by intruders or if your alarm is set off from unknown reasons. You may then request a security guard to patrol your business premise for any suspicious activity before informing police authorities. Access control pads are usually fitted to areas that permit only authorised staff personnel such as the storeroom, back office or the cashier counter. This will allow control over who is allowed to enter these vicinities.